Sometimes, the most important stories we tell aren't about adventures; they're about the quiet moments that happen at home. Family is Everything celebrates the most important people in our lives: our families. This cool-colored kit combines robin's egg and navy blues with neutrals and white for a relaxing, timeless feel. Family is Everything contains traditional, understated elements that don't compete with your priceless photos. Featured elements include cameras, clocks, thematic word art, and a subtle gray alpha. Whether you use it on its own or combine it with other kits you love, the emphasis is on the people in your pages with Family is Everything. It is available at Scraps N Pieces and My Memories. Dive into a magical underwater world of ocean treasures and mermaids! Inspired by the beloved fairy tale of Ariel and in a beautiful soft palette of seafoam green, coral, lavender and pink, Magical Scraps Galore's new collection, Under The Sea, is perfect for scrapping all your underwater adventures, whether you are meeting your favorite sea princess, riding an under-the-sea attraction, or just relaxing on the beach! Included in this digital scrapbooking pack you will find 30 textured papers (21 patterns and 9 solids), one uppercase and lowercase alpha, including numbers and punctuation, and 61 elements. 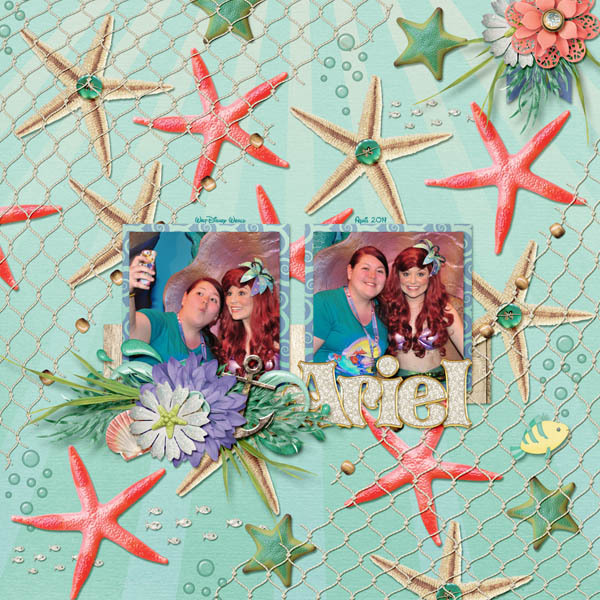 Find it at 30% off through July 28th at Scraps N Pieces, GingerScraps and Gotta Pixel! Stay tuned for Marina's new collection coming to stores in August!